Concentration camps in the Independent State of Croatia on a map of all camps in Yugoslavia in World War II. The Holocaust in the Independent State of Croatia refers primarily to the genocide of Jews, but sometimes also include that of Serbs (the "Genocide of the Serbs") and Romani ( Porajmos ), during World War II within the Independent State of Croatia, a fascist puppet state ruled by the Ustashe regime, that included most of the territory of modern-day Croatia, the whole of modern-day Bosnia and Herzegovina and the eastern part of Syrmia (Serbia). 90% of Croatian Jews were exterminated in Ustashe-run concentration camps like Jasenovac and others, while a considerable number of Jews were rounded up and turned over by the Ustashe for extermination in Nazi Germany. The Serbs are a nation and South Slavic ethnic group that formed in the Balkans. The majority of Serbs inhabit the nation state of Serbia, as well as the disputed territory of Kosovo, and the neighboring countries of Bosnia and Herzegovina, Croatia and Montenegro. They form significant minorities in North Macedonia and Slovenia. There is a large Serb diaspora in Western Europe, and outside Europe there are significant communities in North America and Australia. The Persecution of Serbs in the Independent State of Croatia, also known as the Genocide of the Serbs included the extermination, expulsion and forced religious conversion of hundreds of thousands ethnic Serbs by the genocidal policies of the Ustashe regime in the Independent State of Croatia (NDH) between 1941 and 1945, during World War II. The Ustashe regime systematically murdered approximately 300,000 to 500,000 Serbs out of whom up to 52,000 died at the Jasenovac concentration camp, according to current estimates. On 25 March 1941, Prince Paul of Yugoslavia signed the Tripartite Pact, allying the Kingdom of Yugoslavia with the Axis powers. Prince Paul was overthrown, and a new anti-German government under Peter II and Dušan Simović took power. The new government withdrew its support for the Axis, but did not repudiate the Tripartite Pact. Nevertheless, Axis forces, led by Nazi Germany invaded Yugoslavia in April 1941. Prince Paul of Yugoslavia, also known as Paul Karađorđević, was Prince Regent of Yugoslavia during the minority of King Peter II. Paul was a first cousin of Alexander I and thus a first cousin-once-removed of Peter II. The Tripartite Pact, also known as the Berlin Pact, was an agreement between Germany, Italy and Japan signed in Berlin on 27 September 1940 by, respectively, Joachim von Ribbentrop, Galeazzo Ciano and Saburō Kurusu. It was a defensive military alliance that was eventually joined by Hungary, Romania, Bulgaria and Yugoslavia, as well as by the German client state of Slovakia. Yugoslavia's accession provoked a coup d'état in Belgrade two days later, and Italy and Germany responded by invading Yugoslavia and partitioning the country. The resulting Italo-German client state known as the Independent State of Croatia joined the pact on 15 June 1941. The Kingdom of Yugoslavia was a state in Southeast Europe and Central Europe that existed from 1929 until 1941, during the interwar period and beginning of World War II. The Independent State of Croatia was a World War II fascist puppet state of Germany and Italy. It was established in parts of occupied Yugoslavia on 10 April 1941, after the invasion by the Axis powers. 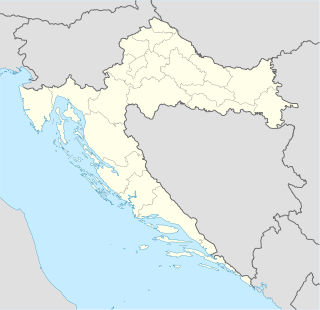 Its territory consisted of most of modern-day Croatia and Bosnia and Herzegovina, as well as some parts of modern-day Serbia and Slovenia, but also excluded many Croat-populated areas in Dalmatia, Istria, and Međimurje regions. A Jewish prisoner is forced to remove his ring upon arrival in the Jasenovac concentration camp. Ustaše executing people over a mass grave near Jasenovac. The main race laws in the Independent State of Croatia were adopted and signed by the Ustaše leader Ante Pavelić on 30 April 1941: the "Legal Decree on Racial Origins" (Zakonska odredba o rasnoj pripadnosti) and the "Legal Decree on the Protection of Aryan Blood and the Honour of the Croatian People" (Zakonska odredba o zaštiti arijske krvi i časti hrvatskog naroda). The "Legal Decree on the Nationalization of the Property of Jews and Jewish Companies" was declared on 10 October 1941. Ante Pavelić was a Croatian general and military dictator who founded and headed the fascist ultranationalist organization known as the Ustaše in 1929 and governed the Independent State of Croatia, a fascist Nazi puppet state built out of Yugoslavia by the authorities of Nazi Germany and Fascist Italy, from 1941 to 1945. Pavelić and the Ustaše persecuted many racial minorities and political opponents in the NDH during the war, including Serbs, Jews, Romani, and anti-fascist Croats. Actions against Jews began immediately after, we ended the safe nations, the Independent State of Croatia was founded. On 10–11 April 1941 a group of prominent Jews in Zagreb was arrested by the Ustaše and held for ransom. On 13 April the same was done in Osijek, where Ustaše and Volksdeutscher mobs destroyed the synagogue and Jewish graveyard. This procedure was repeated in 1941 and 1942 several times with groups of Jews. Already in April 1941 the Ustaše established the concentration camps Danica  (near Koprivnica), Kruščica concentration camp near Travnik  and Kerestinec, where along with communists and other political opponents, the Ustaše imprisoned Jews. On 8 July 1941 the Ustaše ordered that all arrested Jews be sent to Gospić, from where they took the victims to death camps Jadovno on Velebit, and Slano on the island of Pag,  where they carried out mass executions. The historian Paul Mojzes lists 1,998 Jews, 38,010 Serbs, and 88 Croats killed at Jadovno and related execution grounds,  among them 1,000 children. In August 1941 the Ustaše established the Jasenovac concentration camp, one of the largest in Europe. This included the Stara Gradiška concentration camp for women and children. The United States Holocaust Memorial Museum (USHMM) in Washington, D.C. presently estimates that the Ustaša regime murdered between 77,000 and 99,000 people in Jasenovac system of camps between 1941 and 1945. The Jasenovac Memorial Site quotes a similar figure of between 80,000 and 100,000 victims. Of these, the United States Holocaust Museum says that at least 20.000 were Jews. Order for Serbs and Jews to move out of their homes in specified parts of Zagreb to other parts of the city, Croatia and a warning of forcible expulsion and punishment of those that failed to comply. Many historians describe the Ustasha regime's mass killings of Serbs as meeting the definition of genocide. Some racist laws, brought from Germany, in addition to Jews and Roma, were applied to the Serbs. Vladimir Žerjavić estimates that 322,000 Serbs were killed in the Independent State of Croatia, out of a total population of 1.8 million Serbs. Thus one in six Serbs were killed, which represents the highest percentage killed in Europe, after the Jews and Roma. Of these Žerjavić estimates that about 78,000 Serbs were killed at Jasenovac and other Ustasha camps. According to the United States Holocaust Memorial Museum in Washington, D.C., between 320,000 and 340,000 Serbs were killed in the NDH. The Ustasha regime launched the persecution of the Roma in May 1942. Whole families were arrested and transported to the Jasenovac concentration camp, where they were immediately, or within a few months, killed. Estimates of the number of victims vary from 16,000 (this figure is given Vladimir Žerjavić) to 40,000. The Jasenovac Memorial at Jasenovac, Croatia lists the names of 16,173 Roma killed at that concentration camp. Due to their way of life, many more victims are probably unrecorded. The German historian Alexander Korb and the United States Holocaust Memorial Museum in Washington, D.C., both estimate at least 25,000 casualties among the Roma, which represents nearly the total Roma population in the Independent State of Croatia. Over one hundred Croatians have been recognized as Righteous among the Nations. They include Žarko Dolinar and Mate Ujević. The Jasenovac concentration camp was an extermination camp established in Slavonia by the authorities of the Independent State of Croatia (NDH) during World War II. The camp was established and operated solely by the governing Ustaše regime rather than by Nazi Germany as in the rest of occupied Europe. It was one of the largest concentration camps in Europe and it has been referred to as "the Auschwitz of the Balkans" and "the Yugoslav Auschwitz". The Ustaša – Croatian Revolutionary Movement, commonly known as Ustaše, was a Croatian fascist, racist, ultranationalist and terrorist organization, active, as one organization, between 1929 and 1945. Its members murdered hundreds of thousands of Serbs, Jews, and Roma as well as political dissidents in Yugoslavia during World War II. Vladimir Žerjavić was a Croatian economist and demographer who published a series of historical articles and books during the 1980s and 1990s on demographic losses in Yugoslavia during World War II and of Axis forces and civilians in the Bleiburg repatriations shortly after the capitulation of Germany. Since 1964, he worked as an adviser in the United Nations Economic Commission for Africa. Jure Francetić was a Croatian Ustaša Commissioner for the Bosnia and Herzegovina regions of the Independent State of Croatia (NDH) during World War II, and commander of the 1st Ustaše Regiment of the Ustaše Militia, later known as the Black Legion. In both roles he was responsible for the massacre of Bosnian Serbs and Jews. A member of Ante Pavelić's inner circle, he was considered by many Ustaše as a possible successor to Pavelić as Poglavnik (leader) of the NDH. He died of wounds inflicted when he was captured by Partisans near Slunj in the Kordun region when his aircraft crash-landed there in late December 1942. Ljubomir "Ljubo" Miloš was an Ustaše official in the Independent State of Croatia (NDH) during World War II. He served as commandant of the Jasenovac concentration camp on several occasions and was responsible for various atrocities committed there during the war. He fled Yugoslavia in May 1945 and sought refuge in Austria. In 1947, he returned to Yugoslavia with the intention of starting an anti-communist uprising. He was soon arrested by Yugoslav authorities and charged with war crimes. Miloš was found guilty on all counts and hanged in August 1948. Vjekoslav "Maks" Luburić was a Bosnian Croat member of the fascist Ustaše movement who headed the system of concentration camps in the Independent State of Croatia (NDH) during much of World War II. Luburić also personally oversaw multiple massacres of Serbs, and spearheaded the contemporaneous genocides of Jews and Roma in the NDH. Dinko Šakić was a Croatian fascist leader who commanded the Jasenovac concentration camp in the Independent State of Croatia (NDH) from April to November 1944, during World War II. Born in the village of Studenci, near the town of Imotski in what was then the Kingdom of Serbs, Croats and Slovenes, he became a member of the fascist Ustaše at a young age. When the Axis powers occupied the Kingdom of Yugoslavia in April 1941, Šakić, aged 19, joined the administration in Jasenovac. He became the camp's assistant commander the following year, and married Nada Luburić, the half-sister of concentration camp commander Vjekoslav "Maks" Luburić, in 1943. 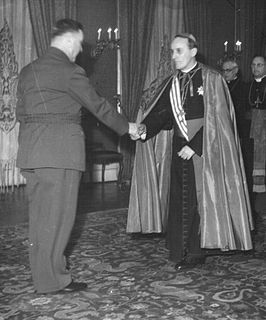 This marriage, as well as his fanatic support for Ustaše leader Ante Pavelić, led to Šakić's appointment as commander of Jasenovac in April 1944. He was charged in the deaths of an estimated 2,000 people who died during his six months of command at the concentration camp. The Glina massacres were killings of Serb peasants in the town of Glina in the Independent State of Croatia (NDH) that occurred between May and August 1941, during World War II. The first wave of massacres in the town began on 11 or 12 May 1941, when a band of Ustaše led by Mirko Puk murdered a group of Serb men and boys in a Serbian Orthodox church before setting it on fire. The following day, approximately 100 Serb males were murdered by the Ustaše in the nearby village of Prekopi. Estimates of the overall number of Serbs killed from 11–13 May range from 260 to 417. Further killings in Glina occurred between 30 July and 3 August of that same year, when 700–2,000 Serbs were massacred by a group of Ustaše led by Vjekoslav Luburić. Ljubo Jednak, the only survivor of these killings, went on to testify at the trials of the several prominent figures in the NDH after the war. Puk was captured by British forces in 1945 while attempting to flee to Austria and was extradited to Yugoslavia the following year, where he committed suicide. Luburić escaped Yugoslavia after the war and moved to Francoist Spain, where he was killed by a person generally assumed to be an agent of the Yugoslav State Security Service. The Jadovno concentration camp was a concentration and extermination camp in the Independent State of Croatia (NDH) during World War II. Commanded by Juco Rukavina, it was the first of twenty-six concentration camps in the NDH during the war. Established in a secluded area about 20 kilometres (12 mi) from the town of Gospić, it held thousands of Serbs and Jews over a period of 122 days from May to August 1941. Inmates were usually killed by being pushed into deep ravines located near the camp. Estimates of the number of deaths at Jadovno range from 10,000 to 68,000, mostly Serbs. The camp was closed on 21 August 1941, and the area where it was located was later handed over to the Kingdom of Italy and became part of Italian Zones II and III. Jadvono was replaced by the greater sized Jasenovac concentration camp and its extermination facilities. Edgar Angeli was Croatian rear admiral of Navy of the Independent State of Croatia. The Ustashe Militia was the party army of the Ustashe, established by the fascist regime of Ante Pavelić in the Axis puppet state the Independent State of Croatia (NDH) in Yugoslavia during World War II. Zdenko Blažeković was a Croatian fascist official who held several posts in the World War II Ustaše regime in the Independent State of Croatia (NDH). He was the student commissar at the Ustaše University Centre (USS), leader of the male Ustaše Youth organisation and a sports commissioner in the NDH. Jasenovac – istina is a 2016 documentary film by Croatian filmmaker Jakov Sedlar. The film contends that the extent of The Holocaust in Croatia and the World War II-era genocide of the country's Serb population was exaggerated through post-war communist propaganda. It focuses primarily on Jasenovac, a concentration camp run by Croatia's wartime fascist Ustaše government where an estimated 100,000 are believed to have perished, and suggests that the actual death toll never exceeded 18,000. The film also argues that Jasenovac continued being used as a concentration camp by Yugoslavia's communist authorities well after World War II, and that more inmates perished when it was run by the communists than when it was run by the Ustaše. Marijan Mijo Babić (1903–1941), nicknamed Giovanni, was a deputy of the Croatian fascist dictator Ante Pavelić, and the first commander of all concentration camps in the Independent State of Croatia. He was head of the Third Bureau of the Ustasha Surveillance Service, and was also a member of the Main Ustaše Headquarters, one of the two main deputies of Pavelić. The Kruščica concentration camp was a concentration camp established in the Independent State of Croatia during World War II. This short-lived camp was founded in April 1941 for women and children. The camp was founded by Mijo Babić, a deputy of the Croatian fascist dictator Ante Pavelić, and the first commander of all concentration camps in the Independent State of Croatia. The Gospić concentration camp was one of 26 concentration camps in the Independent State of Croatia during World War II, established in Gospić. 1 2 3 4 5 Boško Zuckerman, "Prilog proučavanju antisemitizma i protužidovske propagande u vodećem zagrebačkom ustaškom tisku (1941-1943)" Zavod za hrvatsku povijest, vol 42, Zagreb (2010). ↑ Phayer 2000, p. 35. ↑ Phayer 2000, p. 34. ↑ Despot, Zvonimir. "Kako je osnovan prvi ustaški logor u NDH". Vecernji list. ↑ "HAPŠENJE 165 JEVREJSKIH OMLADINACA U ZAGREBU U MAJU 1941. GODINE". ↑ "Concentration camp "Uvala Slana", Pag island". Archived from the original on 2014-04-07. 1 2 Mojzes 2011, p. 60. ↑ Mojzes 2009, p. 160. ↑ Pavlowitch 2008, p. 34. 1 2 "Jasenovac". United States Holocaust Memorial Museum. 1 2 3 "Poimenični Popis Žrtava KCL Jasenovac 1941-1945" [List of Individual Victims KCL Jasenovac 1941-1945] (in Croatian). Spomen podrucje Jasenovac Memorial Site. 1 2 "'U NDH je rješeno židovsko pitanje'". Jutarnji list. Retrieved 17 April 2014. ↑ Goldstein, Ivo. Holokaust u Zagrebu, Novi liber, Zagreb, 2001, p. 472. 1 2 Krizman, Narcisa Lengel. Antisemitizam Holokaust Antifašizam, Studia Iudaico-Croatica, Zagreb, 1996, p. 256. ↑ Sudbina međimurskih Židova, povijest.net; accessed 23 October 2016. ↑ Ivo Goldstein. "Uspon i pad NDH". Faculty of Humanities and Social Sciences, University of Zagreb. Archived from the original on 17 July 2011. Retrieved 20 February 2011. ↑ Samuel Totten, William S. Parsons (1997). Century of genocide: critical essays and eyewitness accounts. p. 430. ISBN 0-203-89043-4 . Retrieved 28 September 2010. ↑ "Mesić: Jasenovac je bio poprište genocida, holokausta i ratnih stratišta" (in Croatian). Index.hr. 30 April 2006. Retrieved 28 September 2010. ↑ Robert M. Hayden. "Independent State of Croatia". e-notes. Retrieved 20 February 2011. 1 2 3 "Axis Invasion of Yugoslavia". United States Holocaust Memorial Museum. Retrieved 19 April 2014. ↑ Zerjavic, Vladimir. "YUGOSLAVIA-MANIPULATIONS -WITH THE NUMBER OF SECOND WORLD WAR VICTIMS". Croatian Information Center. Retrieved 19 April 2014. ↑ "Names of Righteous by Country | www.yadvashem.org". statistics.html. Bartulin, Nevenko (2008). "The Ideology of Nation and Race: The Croatian Ustasha Regime and its Policies toward the Serbs in the Independent State of Croatia 1941-1945". Croatian Studies Review. 5: 75–102. Bulajić, Milan (1994). Tudjman's "Jasenovac Myth": Genocide against Serbs, Jews and Gypsies. Belgrade: Stručna knjiga. Cvetković, Dragan (2011). "Holokaust u Nezavisnoj Državi Hrvatskoj - numeričko određenje" (PDF). Istorija 20. veka: Časopis Instituta za savremenu istoriju. 29 (1): 163–182. Hory, Ladislaus; Broszat, Martin (1964). Der kroatische Ustascha-Staat1941-1945. Stuttgart: Deutsche Verlags-Anstalt. Kolstø, Pål (2011). "The Serbian-Croatian Controversy over Jasenovac". Serbia and the Serbs in World War Two. Palgrave Macmillan UK. pp. 225–246. ISBN 9780230347816. Korb, Alexander (2010). "A Multipronged Attack: Ustaša Persecution of Serbs, Jews, and Roma in Wartime Croatia". Eradicating Differences: The Treatment of Minorities in Nazi-Dominated Europe. Newcastle upon Tyne: Cambridge Scholars Publishing. pp. 145–163. ISBN 9781443824491. Levy, Michele Frucht (2011). "'The Last Bullet for the Last Serb': The Ustaša Genocide against Serbs: 1941–1945". Crimes of State Past and Present: Government-Sponsored Atrocities and International Legal Responses. Routledge. pp. 54–84. ISBN 9781317986829. Lituchy, Barry M., ed. (2006). Jasenovac and the Holocaust in Yugoslavia: Analyses and Survivor Testimonies. New York: Jasenovac Research Institute. ISBN 9780975343203. Mojzes, Paul (2008). "The Genocidal Twentieth Century in the Balkans". Confronting Genocide: Judaism, Christianity, Islam. Lanham: Lexington Books. pp. 151–182. Mojzes, Paul (2011). Balkan Genocides: Holocaust and Ethnic Cleansing in the 20th Century. Lanham: Rowman & Littlefield. Yeomans, Rory (2013). Visions of Annihilation: The Ustasha Regime and the Cultural Politics of Fascism, 1941-1945. Pittsburgh: University of Pittsburgh Press. Wikimedia Commons has media related to The Holocaust in Croatia .